My new enemy in the state of Minnesota is the mosquito. Apparently they like the type of perspiration that I exude – although, quite frankly, I didn’t think I had much perspiration. But, the mosquitoes love me. I’ve had only a few bites but they have been firm about it. I don’t remember mosquitoes being dark colored. My mind remembers them being brown growing up in Chicago. Today, in my effort to find out more about my enemy, I found out that the Dragonfly will eat the mosquito in all stages of its life. We have had a lot of dragonflies flitting this way and that. I never understood why. Now, I do. And I don’t feel so threatened by the mosquito anymore. 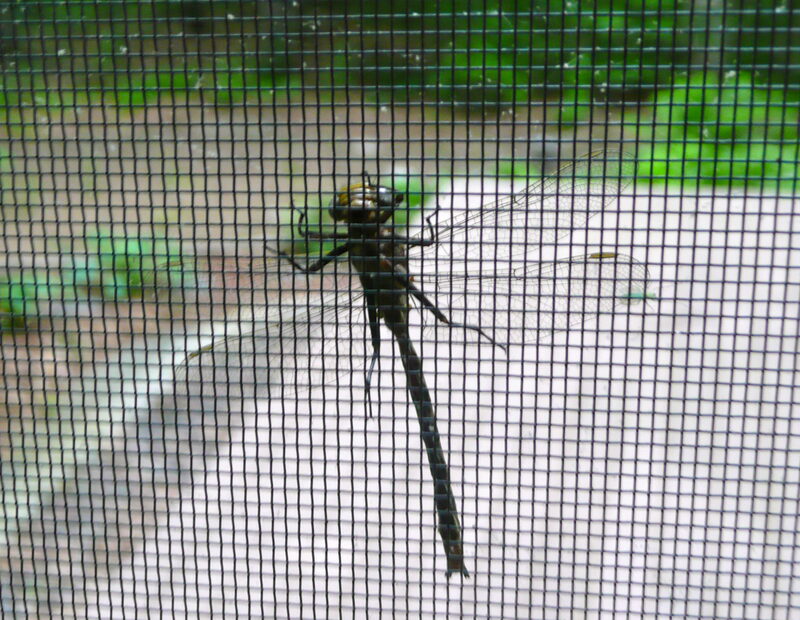 Unfortunately, this particular dragonfly got hooked on my porch screen and it took a long time for him to get off. Maybe he was just saying “hey, we’re here to help.” Awwww ….